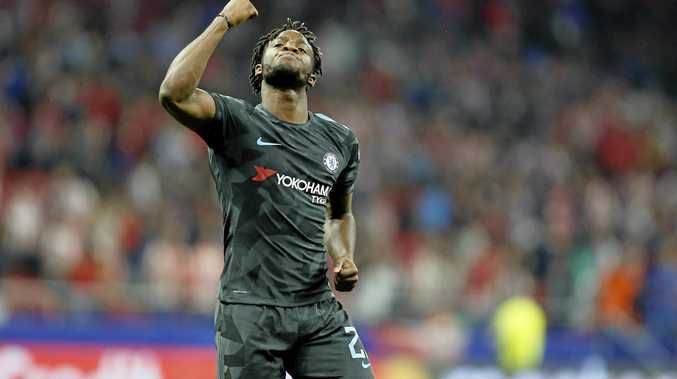 AN injury-time winner for Michy Batshuayi helped Chelsea take all three points at Atletico Madrid on a good night for English clubs in the Uefa Champions League. The English Premier League champion went behind after David Luiz gave away a penalty and Antoine Griezmann slotted past keeper Thibaut Courtois. Former Real Madrid striker Real Madrid striker Alvaro Morata headed in an excellent Eden Hazard cross to grab an equaliser to set up a close finish. Antonio Conte's men deserved all three points and snatched the win in the fourth minute of added time as Belgian subsitute Batshuayi picked out the bottom corner. Manchester United had an easier night in Russia with a comfortable 4-1 success over CSKA Moscow. Romelu Lukaku continued his extraordinary start to life at the club with a brace. The Belgian striker headed Jose Mourinho's visitors in front, before Anthony Martial made it two from the penalty spot. Lukaku tapped in his 10th goal of the season before half-time and Henrikh Mkhitaryan scored the fourth before a late consolation from teenager Konstantin Kuchaev. Paris St Germain, meanwhile, delivered a statement of intent with a 3-0 home win over Bayern Munich. Neymar teed up fellow Brazilian Dani Alves to hammer home after two minutes before Edinson Cavani finished a sweeping counter-attack with an exquisite strike into the top corner. Unai Emery's men finished off the Germans in the 63rd minute when Neymar pounced after Kylian Mbappe had bamboozled the Bayern defence. PSG now lead the five-time champions by three points in the race to finish top of Group B.
Barcelona overcame a stuttering display to edge out Sporting 1-0 in the Portuguese capital thanks to a Sebastian Coates' own goal. Celtic cruised past Anderlecht 3-0 in what looks to be a fight for third place behind PSG and Bayern in Group B.